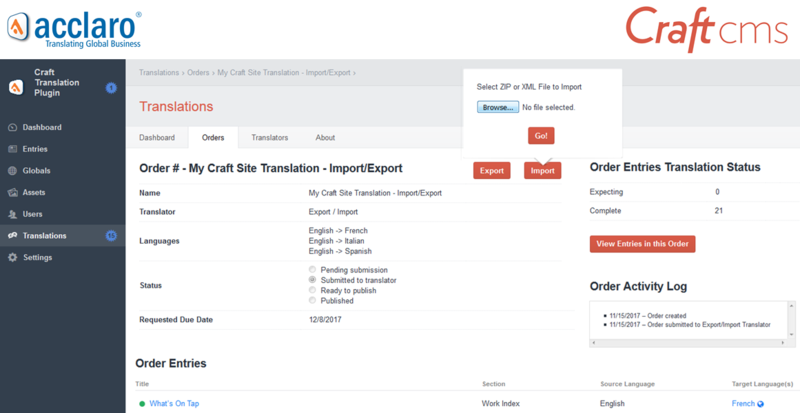 Translation Plugin for Craft CMS. Multilingual Craft Sites Made Easy. Launch multilingual Craft content faster. Work with any translator, internally or third party. Create efficiencies for reduced cost. Choose from 2 packages - plugin only for $990 or plugin bundle with plugin, one year of updates and premium support for $2490. Eliminate error prone and costly copy/paste processes. Launch multilingual Craft web content faster. Opt for our $990 plugin or choose our $2,490 plugin bundle with 1 year of updates - including for Craft 3 - and premium support. Installation takes only a couple of minutes and configuration is easy with the help of our handy guides, videos, FAQs and Quick Start Guide. Now you're all set to send content for translation. Our 30 day money back guarantee ensures you get the best experience possible! We love Acclaro’s Translation Plugin for Craft so much we’re using it to translate the content on our website! It’s smart, easy to use, and backed by Acclaro’s top-notch service. A translation integration is something the Craft community has been asking for and we couldn’t be happier to team up with Acclaro on making it happen.